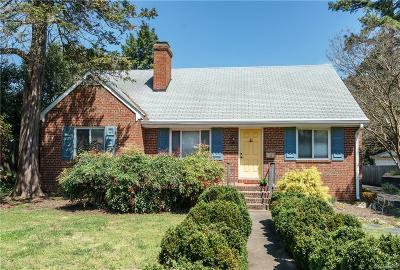 This all brick ranch in the heart of the Willow Lawn area is ready for new owners! You'll find beautiful hardwood floors in the formal rooms as you enter this home. The LR has a gas fireplace and built-in bookshelves. The Dining Room has lots of light and leads to an updated kitchen. This eat-in kitchen has gas cooking! All kitchen appliances convey. The dining area also has built ins and leads to a cozy TV room. The 1ST FLOOR MASTER has a walk-in closet, bay window, additional closet, and room for a king sized bed. The 2nd bedroom also has a larger closet. The bathroom also has been updated, a half bath is located in the laundry room. The front yard is very private from the street, has a sitting porch, mature landscaping boasting boxwoods, camellias, and crepe myrtles. A paved driveway provides OFF STREET PARKING and leads to a private, partially fenced backyard with a GARAGE. Directions: On Patterson Between Spokane And Harlan.